Your car’s brakes are the most important component of your vehicle’s safety. Don’t delay replacement, repairs or inspection. The next time you drive by our auto shop on Old Wake Forest Road, “pump the brakes” and stop in — no appointment necessary! Our team of automotive experts are even able to handle the car brake needs of commercial clients — ask about our fleet services! Quiet – As you probably already know, squeaking brakes are usually not a good thing — it could be a sign you need your brakes replaced. Brakes can begin to squeak based on a number of reasons, including the amount of dust in your area, etc., but they might indicate that your brakes are worn. Handles Sudden Stops – You need your brakes to perform, even in poor weather and road conditions. Good brakes can stop “on a dime,” leaving you with plenty of space to avoid collisions. The ability to stop suddenly also works hand-in-hand with the condition of your vehicle’s tires. Brake Fluid Is Clean – Your car’s brake fluid can get dirty over time, but it’s not something you need to concern yourself with but every so often. Most newly-applied brake fluids are clear in color — any discoloration is a sign you might need your fluid changed. For brake pads, discs, rotors, fluid and more, contact or stop by TransMedics today. 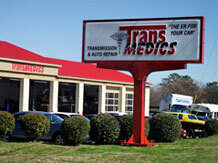 We’re located near the corner of Old Wake Forest and Millbrook Road in North Raleigh. For over a decade, we’ve proudly served motorists from throughout the NC Triangle!